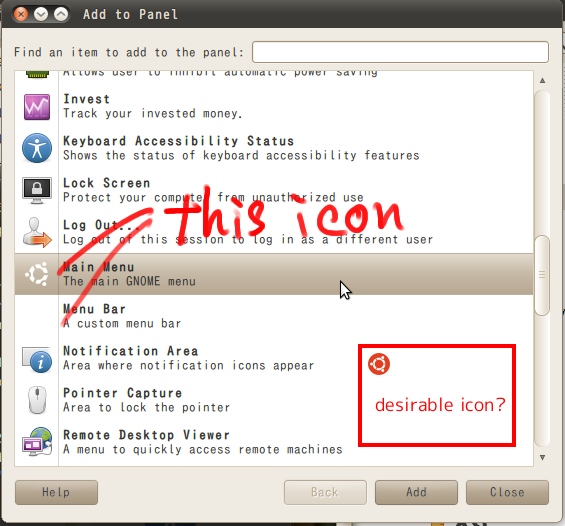 Ubuntu icon in item select window is white in white background, so it is better to change. I attached screenshot and idea (orange icon is used in software-center). I can confirm this issue is still occurring under latest release of Lucid (fully updated), I will send this requirement to upstream and let Gnome developers check in more detailed form. The icon used there is the "start-here" icon. One workaround for this is adding a 32 and 48px color start-here icon. This is how it is done in Humanity[where this bug does not occur].